Bristol Palin told us some time ago that she wants the experiences she’s had in her own life to make a difference in the lives of others. She has begun making that difference by promoting abstinence. The abstinence message needs to be delivered far and wide, and I applaud her for being a vessel to do just that. After giving birth to her beautiful baby boy, Tripp, she discovered the challenges of being a teenage mom. Although her son fills her with incredible joy, she understands that her situation has been made easier because she has such a strong support base. Not everyone has a family to stand with them as the Palins have stood with Bristol. The love, stability, and encouragement she’s received have made all the difference in the world. In spite of what her mother, Governor Palin, would call “less than ideal circumstances,” Bristol is a good mother doing a good job. God bless her. Her message to people now is to “pause before you play.” In other words, wait. Is that hypocritical, as some people have asserted? I mean, how dare she, who did not wait, tell others to wait? Actually, what Bristol is saying is abstinence is the only 100% fool-proof method to avoid pregnancy, and she’s embracing that in her own life. And is it ever hypocritical for one to learn from her experiences and then to share those lessons with others? No, it’s called maturity, wisdom, and plain old common sense. Bristol is taking her abstinence message a step further now. She has signed with Single Source Speakers and will be influencing even more people as she shares her personal story–about abstinence and a number of other topics. Bristol Palin is hitting the speakers’ circuit and will command between $15,000 and $30,000 for each appearance, Palin family attorney Thomas Van Flein said Monday. Van Flein confirmed a report by celebrity news website RadarOnline that the daughter of former Alaska Gov. Sarah Palin has signed with Single Source Speakers. He added her exact fees will depend on factors such as which group she’s addressing and what she must to do prepare. [Van Flein] said he believes she’s interested in expanding her message beyond teen pregnancy to include her experiences on the campaign trail and in the media spotlight; her parenting approach; and her outlook on life. Before I left for Alaska last summer, our youth pastor’s wife said, “Tell Bristol Palin we’d love for her to come talk to our youth group.” So…if you’re reading this, Bristol, how ’bout it? A trip to New York? Still I can’t help but feel outraged on behalf of Arizona’s citizens for the incompetence shown by these Administration officials. Arizonans have the courage to do what the Obama administration has failed to do in its first year and a half in office – namely secure our border and enforce our federal laws. We wrote earlier, that while Sarah Palin was standing firmly with Arizona Governor Jan Brewer, and her brave action to help curb the violence and other crime that her state faces as it is invaded by foreign forces of illegal aliens, the Obama regime was making a full throated apology to China! China is one of the world’s worst violators of human rights on the planet. How DARE Barack Obama, or anyone representing the Obama regime, apologize to any nation, but especially China, for upholding the Rule of Law in THIS Nation. In short Obama is the most un-American scoundrel this nation has ever had in our government. I honestly expect “Barack Obama” to replace “Benedict Arnold” as the universal name for a traitor in American society. At least Benedict Arnold served his nation honorably, for a time. Barack Obama’s entire life has been dedicated to the downfall of American society. It’s past time to no longer accept the hate and division Barack Obama preaches. It’s past time to no longer accept the unabashed anti-Americanism that spews forth from Barack Obama, the Obama regime, and the Marxist-democrat party. We know that many in the Obama regime, and no doubt Obama himself, admire Communist China. One of Obama’s closest advisers, Anita Dunn told school children that Mao Tse Tung a brutal, murderous dictator, who killed tens of millions of his own people, was her favorite philosopher! Some of Obama’s Czars, like Cass Sunstein, John Holdren, and Ezekiel Emanuel actually advocate the very human rights violations that Sarah lists, including forced abortions, censorship of free speech, and arbitrary detentions. With that said, America is not a communist nation, yet, and if the Americans have their say, it never will be. This nation cannot wait until 2012 to be rid of this guy. We must take back the House and Senate this fall, and we must do it in unprecedented numbers. Once achieved our new Congress must start working toward both neutering the Obama regime, and ultimately removing it. Barack Obama and his people are embarrassments to the entire nation. Their deep hatred for America, and the American people cannot be allowed to continue to effect our once proud standing in the world. On March 28, 2010, I posted an article questioning where Obama’s loyalty lies, based on his associations and choice of Marxist reading materials. He compares Arizona’s law to secure that state’s borders to a regime that has a horrific human rights record. His administration apologizes for that state doing the job his administration is supposed to do. Gov. 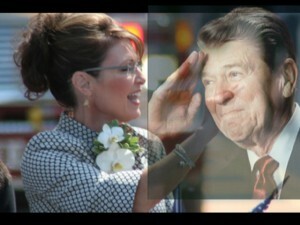 Palin is Presidential. Obama is a complete, absolute, and utter disgrace to the office he holds. Thomas Van Flein has announced that Bristol Palin has signed a contract with Single Source Speakers for appearances and speaking engagements (h/tp Denise Spencer). Congratulations, Bristol! We are so proud of you! Van Flein confirmed a report by celebrity news website RadarOnline that the daughter of former Gov. Sarah Palin has signed with Single Source Speakers. He added her exact fees will depend on factors such as which group she’s addressing and what she must to do prepare. Bristol Palin, 19, is listed on the speaking group’s website as available for conferences, fundraisers, special events and holidays, as well as women’s, youth, abstinence and “pro-life” programs. Her fee is denoted by four question marks, meaning “Call to discuss!” The same designation is given to New Orleans Saints quarterback Drew Brees. Van Flein said Bristol Palin will be selective in the speeches she gives. He said he believes she’s interested in expanding her message beyond teen pregnancy to include her experiences on the campaign trail and in the media spotlight; her parenting approach; and her outlook on life. Bristol Palin lives in Anchorage and works in a physician’s office, Van Flein said. Gov. Palin is a lifetime member of the NRA with an A+ rating and she described the first of the anti-Second Amendment attacks, which came in the form of an interview. The reporter asked the Governor if “gun violence is a health issue,” because of the money spent treating gunshot victims. Gov. Palin had responded that money is spent on treating car accident victims and that more people die in car accidents than by gunshot wounds, but no one is making driving a health issue. She described how her response was cut and immediately followed by footage of a shot person on a gurney in a naked attempt at emotionalizing the issue. Gov. 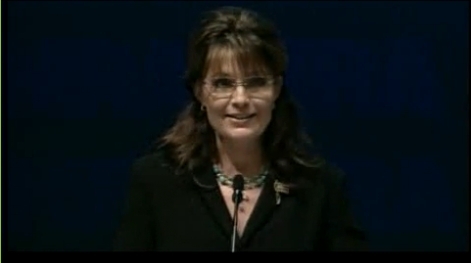 Palin related how she was writing a speech for a gun collector’s club in the spring of 2009. Her daughter, Piper was present while the speech was being written, so she asked Piper, “What do you think if government were to take away guns and only the bad guys would have the guns.” Piper responded, “Ugh…we’d be losers because we would be left with just the bow and arrow!” Gov. Palin thought, “all the wisdom of a child.” Gov. Palin said that in countries where private gun ownership was banned or severely restricted, violent crime increased. Nationwide, gun-ownership is at an all-time high and crime is at a 30-year low. “The fear of a strong, armed law-abiding citizen is often enough to stop a crime. Criminals don’t target people who can defend themselves,” she said. Gov. Palin slammed the double hypocrisy of Hollywood celebrities who hate guns but have no problem hiring armed body guards and starring in “shoot ’em up movies complete with cute starlets blasting off AK47s.” But, these same celebrities do not want us to have guns to protect our families and property. She also spoke about the news media’s lack of subject matter knowledge. When Gov. 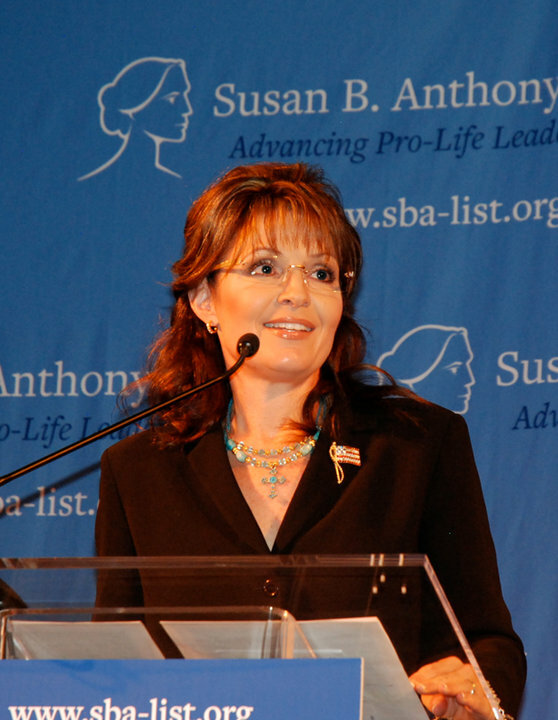 Palin was pregnant with Piper, a friend threw a baby shower at the Grouse Ridge Shooting Grounds in Wasilla, AK. She wrote about this baby shower in Going Rogue, on page 77. Gov. Palin was photographed carrying an over/under double-barrel shotgun over her shoulder unloaded with the breech open. An LA Times fashion editor tried to portray Gov. Palin as being an “idiot” saying a “rifle” should not be carried that way, because she might blow her foot off. The editor obviously did not know the difference between a rifle and a shotgun. Gov. 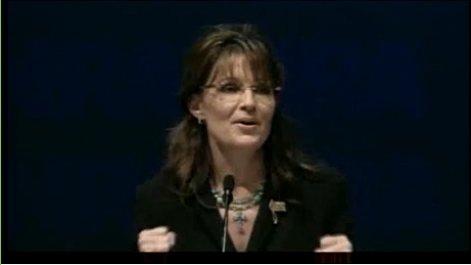 Palin spoke about the negative portrayal of the TEA Party movement by liberal reporters, though she said the “redneck” part does not bother her. Gov. 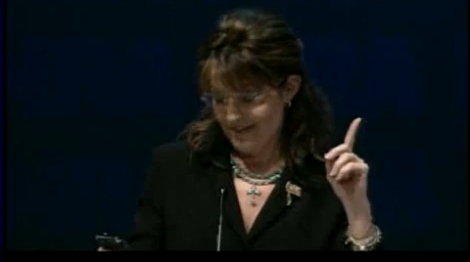 Palin recited a list of several “you might be a redneck if” jokes and how she fit into every one. She said the jokes were written as if her diaries had been opened. Gov. 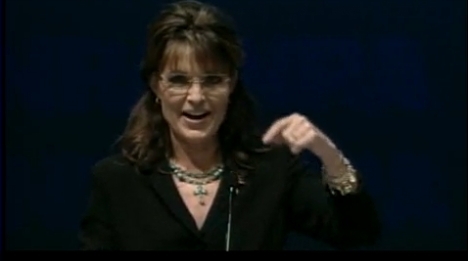 Palin said that the venison sold in Whole Foods and in fancy restaurants did not come from deer that died of natural causes or that was hit by a car on the road. It came from deer harvested by hunters. “These left wingers are so interested in healthy, organic food. So am I. I just happen to have to shoot the food, before I eat the organic food,” Gov. Palin said. She chided these animal rights groups intolerance of Alaskans and her indigenous peoples’ subsistence lifestyle. Gov. 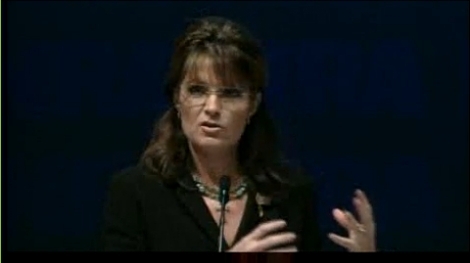 Palin defended Alaska’s predator control program as a scientifically proven method of preserving the state’s wildlife. These anti-hunting groups love animals more than people, she said and they don’t care that rural Alaskans depend on wild game for their sustenance. These Alaskans live hundreds of miles away from any grocery store. “These anti-hunting groups have more love for predatory wolf packs than hungry human beings,” she said. Animal rights groups routinely traffic in distorted imagery of Gov. Palin herself “aerial hunting,” using PhotoShopped images of her hanging off a helicopter skid with one hand massacring wolf packs with an AK47 in the other, she said. Predator control is not hunting. It is a permit-regulated activity at the federal and state levels. She said the program has saved entire herds of caribou and other wild game by eradicating just one wolf pack. “The alternative methods don’t work and our state Constitution instructs us to manage for abundance,” she said. Gov. Palin spoke about how these activists are targeting the TLC documentary series she is working on, with their petition to boycott her series. “We’ve got a message for them,” she said. “Bring it on! We’re not going to be intimidated!” The Sarah Palin support blogosphere united and is operating a counter-petition to support her series. On US 4 Palin, the you can access that petition from our upper left sidebar. It is rather Providential that Gov. 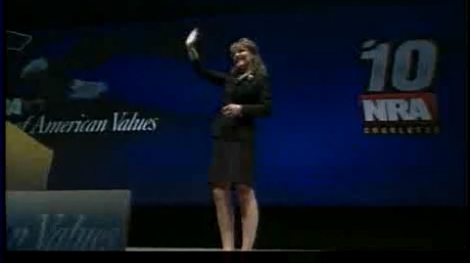 Palin twice referenced AK47s in her speech. To honor its inventor Mikhil Timofeyevich Kalashnikov’s 90th birthday, the NRA featured an Arsenal Arms, limited edition of his later rifle – the AK74 – at Booth 2237, as documented on page 29 of the May 2010 issue of the American Rifleman. While the AK47 fires the 7.62 x 39 mm round, the later AK74 fires the 5.45x39mm. The more powerful and proflific AK47 is what Gov. 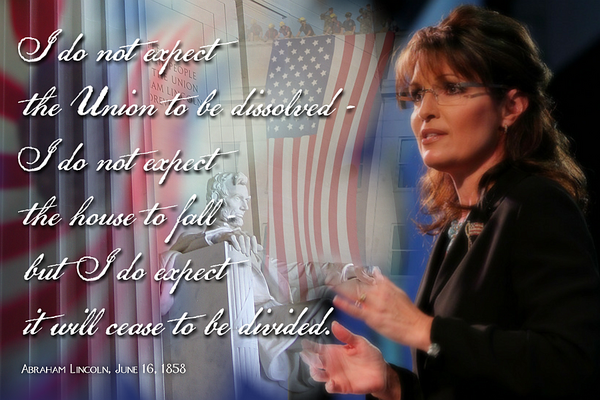 Palin referenced in her speech. “Whether it comes to protecting our families, our nation, or filling our freezers, our Second Amendment rights are part of who we are and we will never apologize for proudly clinging to them,” Gov. Palin said. “President Obama and his allies like Nancy Pelosi have been relatively quiet on the gun control front, not because they don’t want to limit your rights, but because they are afraid of the political consequences. Don’t doubt for a minute that if they thought they could get away with it they would ban guns, and ban ammunition and gut the Second Amendment – it’s the job of the NRA and their allies and all of us to stop them in their tracks,” Gov. Palin said. 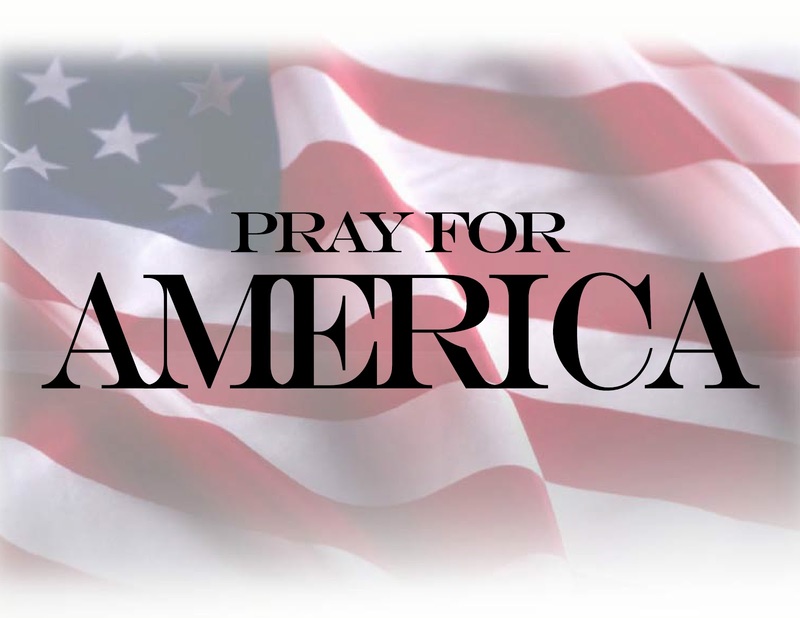 “We are America, God shed His grace on thee. We are the exceptional nation; we shall protect her; we will love her; we will follow her Constitution and will shall not apologize for being so proud of our country,” she concluded to the thunderous applause of the thousands present. The very first photo I ever saw of Gov. Palin was her holding the M4 during her 2007 Kuwait trip. That photo became my avatar, and the logo photo for all my blog accounts. I have written numerous times that Gov. Palin is the Second Amendment’s Guardian Angel, and that I would give her the spare keys to my gun closet without compunction. While Obama’s image often adorns gun shops as the ironic “Salesman of the Month (or Year),” I have seen accounts of Gov. Palin’s image being present in gun shops and in gun closets across our land. 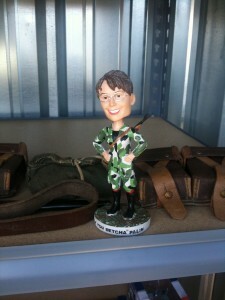 Whether it’s a photo, a bobblehead, or a cardboard cutout, her image is there, because she stands guard.